Batter up! Ballpark Mysteries combine baseball action with exciting whodunits for early chapter book readers! Mike and Kate cant wait to watch their rookie hero Dusty Martin in action. But something is throwing the Blue Jays star off his game. Then, when no one else is looking, Mike sees mysterious ghost lights flying across the field. Is the ballpark haunted? And could Dusty have seen the lights, too? Ballpark Mysteries are the all-star matchup of fun sleuthing and baseball action, perfect for readers of Ron Roys A to Z Mysteries and Matt Christophers sports books, and younger siblings of Mike Lupica fans. Each Ballpark Mystery also features "Dugout Notes," with more amazing baseball facts. DAVID A. KELLY has written for many newspapers and magazines, and Babe Ruth and the Baseball Curse, published in spring 2009, was his first book for children. He lives fifteen minutes from Fenway Park in Newton, Massachusetts. MARK MEYERS grew up in Utah and studied art at the Academy of Art University in San Francisco. 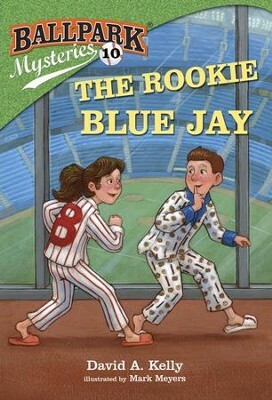 I'm the author/artist and I want to review Ballpark Mysteries #10: The Rookie Blue Jay - eBook.